The Job Apocalypse. It’s difficult to understand and appreciate why the U.S. and global economies are in so much trouble today without understanding the truth about the unemployment rate and why automation and Artificial Intelligence are rapidly gobbling up nearly all human jobs. Despite the high-spun propaganda emanating from Washington, Wall Street, and Silicon Valley, this is an accelerating trend that is already leading to a Malthusian nightmare. For those who have not read my book yet, this article should give you some interesting thoughts to consider until you read the book. 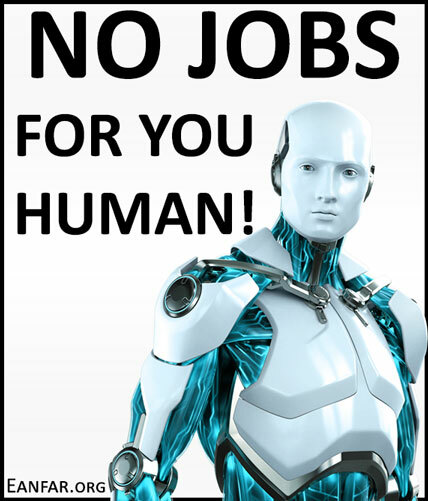 All human jobs can (and most will) be automated. The present and future of the retail sector. After watching those two videos, it should be clear that there is no technical or logical way for the U.S. and global economies to magically offset the number of human jobs that Artificial Intelligence and automation are devouring. This is why the real unemployment rate today is actually over 22% and it will continue rising to 50-75% within your lifetime (assuming you were born after 1955). The Ongoing, Systemic Lie. According to the BLS, the unemployment rate is only 4.3% (as of mid-2017) and has been allegedly falling for nearly a decade. This data from the BLS is a blatant, ongoing, systemic lie intended to conceal the real condition of the U.S. economy. Sadly, I still see many people citing BLS data to celebrate the fictitious economic recovery and massive equities and bond market bubbles. Anybody who understands how the BLS calculates the unemployment rate knows that the official U3 unemployment rate dramatically overstates the health of the labor force, which has obviously been done for political reasons by both dominant political parties since NAFTA was passed in 1994. The Real Unemployment Rate: Approximately 23%. The unemployment rate during the Great Depression in 1933 peaked at 24.9%. When calculating the unemployment rate today using the same methodology used prior to 1994, the U.S. unemployment rate in mid-2017 is about 23%, which is very close to the Great Depression unemployment rate. For the victims of Broken Capitalism today—including nearly 25% of the unemployed and under-employed American labor force and over 90% of Americans who have no retirement savings and are drowning in debt just to survive—a Depression-level unemployment rate is not surprising. Today: More Debt, More Job-Seekers, but Fewer Jobs. In contrast to the American labor force prior to the 1980s, today, men and woman (in nearly equal proportion) desperately want/need to work just to survive. Even with two people working in a household, a comfortable modern lifestyle in the U.S. today is only possible by going into debt for over 90% of the American population. In fact, Americans are now in more debt today than they were before the financial crisis. This is one of the consequences caused by what I define in the book as “Broken Capitalism”. Responding to Defenders of Systemic Fraud. I see many so-called experts in the mainstream media today parroting these official BLS stats like un-thinking zombies, which magnifies the confusion for the general public. Worse, these so-called experts attack anybody who questions the official BLS reports with asinine straw-man arguments like, “So, you really think Trump/Obama/Bush/Clinton personally called the BLS and told them to cook the numbers just before an election?” No, that’s not how this fraud is perpetrated. It’s a systemic fraud based on the deliberately deceptive formula that the BLS has been using to calculate the “headline” unemployment rate since NAFTA was passed in 1994. And the fraud continues because U.S. politicians have distorted incentives to perpetuate the delusions embedded within the neoliberal economic policies that are destroying Capitalism and driving the global economy off a cliff. Propaganda Distorts Human Perception. Without a strong foundation of accurate, nonpartisan data and truth, it’s impossible for any human to develop an accurate perception of reality. Having an accurate understanding of the true health of a country’s labor force is the foundation of all good economic policymaking. This is more critical today than ever before as automation and Artificial Intelligence are knocking on every human’s office door. Regardless of their intentions, when politicians collude with corporate interests and the media to perpetuate economic frauds and fantasies, they conceal their economic ignorance and policymaking negligence, which prevents citizens from holding them accountable for their destructive policies. If you want to learn more about the socioeconomic and political consequences of Artificial Intelligence and what is destroying Capitalism worldwide today and how to fix it, please read Broken Capitalism: This Is How We Fix It. 1. The BLS indicates that approximately 35% of the entire U.S. adult population “do not want a job now,” which is how they justify excluding over 90 million adults from their definition of the “Civilian Labor Force.” However, in their footnotes, they state, “Includes some persons who are not asked if they want a job,” which means they arbitrarily assume that approximately 90 million adults don’t want jobs. Of course, that’s an absurd assumption and ignores many economic policy factors that discourage millions of Americans from working. So, my definition of the “Civilian Labor Force” reasonably counts a significant portion of those 90 million erased humans, including significant subsets of the long-term discouraged/displaced population, college student population, over-age-65 population, non-severe disabled population, all of which are able to perform many jobs. ← Are We in a Propaganda Bubble?